Last year I visited Ontario Power Generation (OPG), the Robert H Saunders Dam located in Cornwall, Ontario. I was impressed with the new visitor center as I was able to gather information about the American Eel population. Unfortunately at that time I was unable to see the actual Eel ladder. When Ontario Power recently contacted me offering an opportunity to get the full tour and some hands on with the Eel ladder, I was more than happy to accept. The American Eel a once healthy thriving species of fish really began a downward spiral in the late eighties and early nineties. Due to over harvesting, at one point American Eel was one of the top three sought after species of fish in the commercial fishing industry. Eel was selling for more than three times the amount of most other fish species. Hydro electric dams also became a concern as Eels were unable to make the upstream swim to there spawning grounds. Eel numbers declined so much that in 2004 the Ontario Government canceled commercial and recreational harvests. The American Eel is now protected under the Endangered Species Act , which protects it from being harmed or killed. 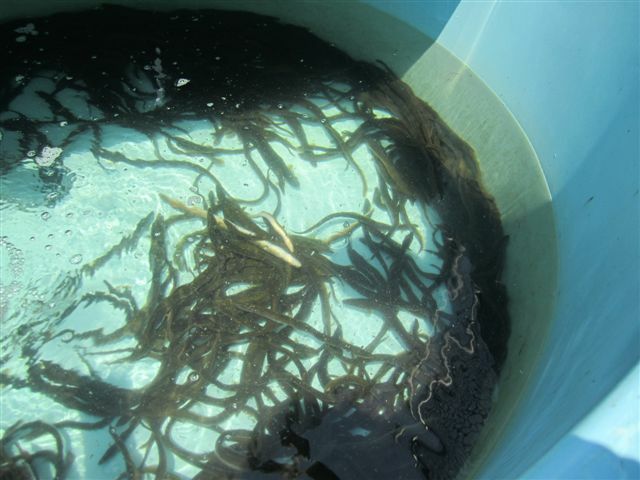 The image above shows the average amount of Eel that pass through the Eel Ladder. The numbers have drastically increased since 2005. The life cycle of the American Eel is very complex. A freshwater species that returns to saltwater to spawn. American Eel are found in coastal freshwater and marine watersstretching from Greenland along the east coast of North American tonorthern South America. Eels are found in Ontario in the St. LawrenceRiver, Lake Ontario, and inland lakes and rivers. 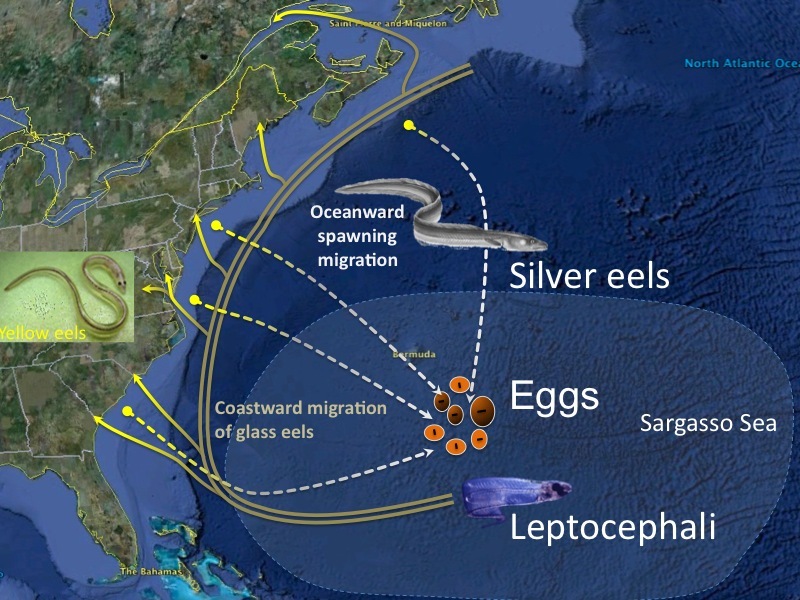 All American Eel are part of the single breeding population thatspawns in only one place in the world, the Sargasso Sea in theAtlantic Ocean. From there, young Eels drift with ocean currents andthen migrate inland into rivers, lakes and streams. Some eels travelas much as 6,000 kilometers over many years. The Eels feed and mature in freshwater for 10 to 25 years beforemigrating back to the Sargasso Sea, where they spawn and die. 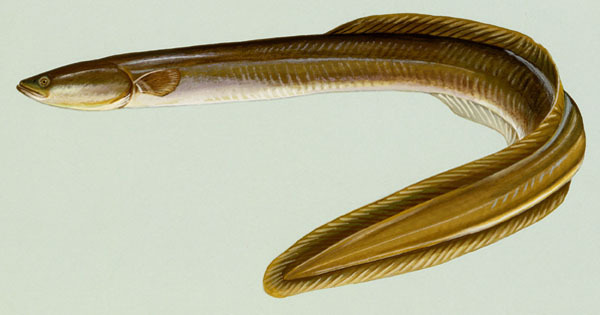 The American Eel is an important part of the diversity of life inLake Ontario and a valuable indicator of the health of the ecosystem.As a top predator, eels help to keep other fish species in balance,including invasive species such as the goby. Ontario Power Generation is acquiringyoung Eels, known as Glass Eels, in the Maritimes and stocking them into theupper St. Lawrence River and Lake Ontario in the hope that this will acceleratethe recovery of the American eel in Ontario. 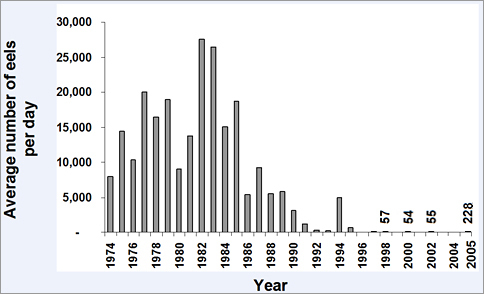 About 3.9 million glass eels havebeen stocked into the upper St. Lawrence River and Lake Ontario since 2006. A model showing the Eel Ladder. Now for the trip down to the bottom, where the Eel ladder starts. The ladder was put in an area of the dam that used to be a place to dump excessive ice buildup in the winter months. It's no longer used so it was a perfect spot for the Eel ladder. The photo above is what you would see looking down from the top of the dam. The walkway with the Eel ladder beside it goes down roughly 85 feet. Once at the bottom there is a pump that adds current to the entrance of the Eel ladder. The natural instinct of the Eel is to head up stream, the current mimic from the pump entices the Eels to enter and head up the ladder. The ladder was upgraded recently, the artificial plants were removed and plastic tubing was installed. This allows the Eels to travel up the ladder more quickly and efficiently. The ladder was also enclosed to provide complete darkness, Eels are more active during the night. A picture of the old system with artificial plants to help the Eels climb. The new system with the plastic tubing. The Eels maneuver in and out of the tubes, it takes less than half the time it used to take the Eel to get to the top. OPG also added counters to help keep count of the number of Eels going up the ladder. At the top the Eels go into a tank that leads to a pipe that takes them to another tank. The white pipe is the gateway to continue the long journey to the spawning ground. Recently OPG added another 300 meters of pipe. This was done to get the Eels farther away from the dam, which allowed the Eels to avoid going through the turbines. That's quite a distance from the dam. It's a safe distance for the Eels. Now the Eels go to another holding tank. The picture above shows the last holding tank. There is a control arm that can send the Eels back to the river or into a holding tank. 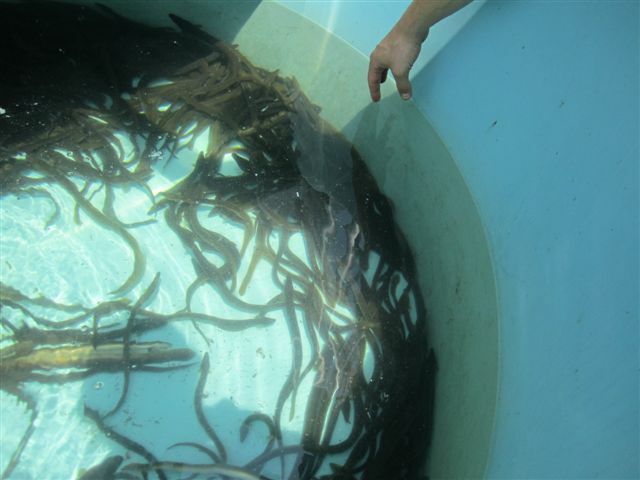 Eels that go into the holding tank are examined then returned to the river. As you can see this system is very effective and a huge success. There are hundreds of Eels in the holding tank, thousands more will pass through this ladder daily while the Eel migration is on. With Kevin Byam, supervisor at the Ontario Power Development Visitor Center. Ontario Power Generation has invested years of research and development into the American Eel restoration project. Not only is the Eel reaping the benefits, the St Lawrence River system along with the Great Lakes Waterway are sustaining a more balanced and healthy ecosystem. Ontario Power has a number of initiatives in place to promote biodiversity , contribute to sustainability and support the environment. A true leader and role model in maintaining a healthy environment.